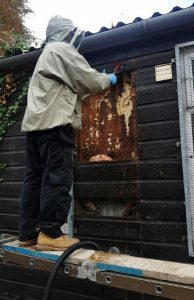 Recently work was undertaken at 126 (City of Derby) Squadron’s headquarters to save a colony of rare honey bees that had taken over one of the wooden huts used by the cadets. The bees had been a major problem for the Squadron for several months because they stopped the cadets from using all of the facilities and it was proving difficult to locate their hive. 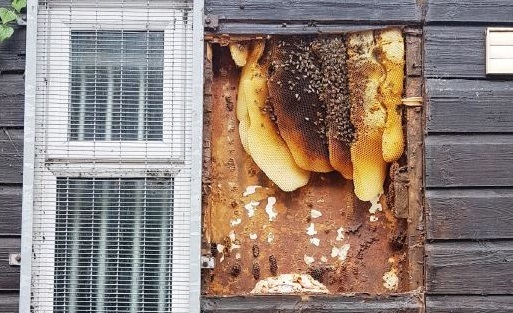 East Midlands Reserve Forces and Cadets Association which manages the building hired a specialist contractor to try and save the hive. Thermal imaging cameras were used to discover the exact location of the hive in the building, the wooden boards they were hiding behind were removed and then the colony was carefully dismantled and transported to Mansfield where they will continue to produce honey. The cavity behind the boards was then cleaned and filled with foam to stop bees from building a new hive in the space next year. Martin Capewell, Head of Estates at East Midlands Reserve Forces and Cadets Association, said: “We understand the great benefits that bees bring to the ecosystem and felt it was our duty to ensure this colony was protected but we could not let them continue to interfere with cadet activities at the site. Bees are one of the most important pollinators for both food production and wild plants. Over the last few years there has been real concern over the number of bees in the UK, in 1900 there were around a million hives in the UK but in 2015 this had declined to just 270,000. Saving and transplanting bees rather than exterminating has helped ensure that they continue to pollinate plants and that the number does not further decline.